Yosemite National Park is a natural wonder. Regardless of the time of year, this spacious attraction of the great outdoors is always filled with stunning beauty. During the winter, Yosemite National Park transforms into a majestic winter wonderland as its many peaks and valleys are draped with a thick blanket of sparkling snow. Once this area has accumulated an adequate snowfall, many people rush to this area with their snowboards and skis in anticipation of a thrilling day out on the slopes! While some are excited about downhill skiing, others are looking forward to Yosemite cross-country skiing. There are numerous trails within this park that are ideal for this activity. Take a look at some helpful tips for Yosemite cross-country skiing and start planning your winter getaway to California today! There are over 350 miles of skiable trails and roads waiting for you in Yosemite National Park! You’ll find some wonderful opportunities for Yosemite cross-country skiing throughout this area. The Yosemite Ski and Snowboard Area (formerly known as the Badger Pass Ski Area) is a fantastic option for outdoor activity this winter. Yosemite cross-country skiing to Glacier Point is a beloved trail of many outdoorsmen as it offers outstanding views of one of the area’s most iconic landmarks. Just outside Yosemite is the Sierra Nevada National Forest and the Stanislaus National Forest, which both offer a wide variety of different trails and terrains that cross-country skiers love. Take a look at all the different options you have in these areas before deciding where to explore first! Winter trails in Yosemite National Park are typically open from mid-December to March. While you’re planning your day of cross-country skiing, be sure to check the local weather report. Winter afternoons in Yosemite can be a comfortable 60 degrees Fahrenheit, but evenings can dip below 0 degrees Fahrenheit. Make sure you are totally prepared for the elements and conditions as you’re getting ready for your adventure! After spending a day on the slopes, find the most comfortable and warm accommodations so you can relax and refresh! 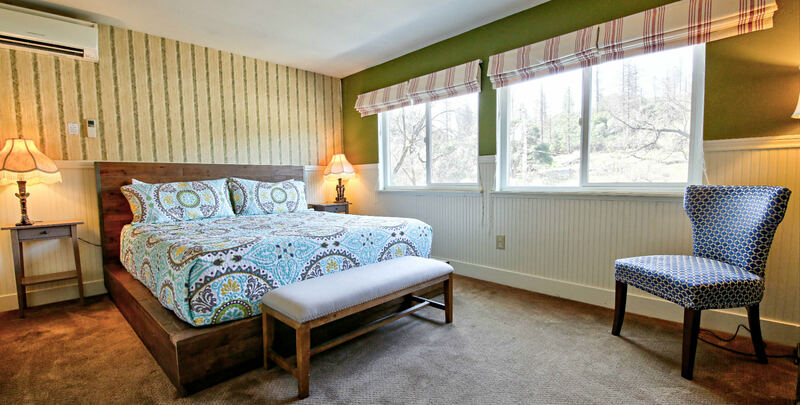 Hotel Charlotte is a historic bed and breakfast in Groveland, California, that offers luxurious lodging within an environment that’s both rustic and elegant. Choose from staying in one of our twelve lovely rooms or renting one of our cozy apartments. You can explore the many attractions of our surrounding town of Groveland, adventure through the magnificent Yosemite National Park, or simply spend time in the warmth of our cozy environment; we have a beautiful living room, friendly and helpful staff, and even our very own restaurant to accommodate all of your needs! Don’t wait another minute to start planning your dream vacation; check our availability and book your stay today! To learn more about the many things to do in Yosemite, like Yosemite cross-country skiing, download our free Vacation Guide!